25+ Food & Culture Experiences in Cities Across the U.S.
Top destinations in Oakland, California; Chicago; Washington, DC; Dallas; Miami; and New York City. Fox Theater Instead of vaudeville acts, this newly restored 1920s theater books indie bands like Vampire Weekend (thefoxoakland.com). Flora Across the street from the Fox, Flora combines a Prohibition-style cocktail list with only-in-California dishes like seared dayboat scallops with beets and kumquat relish, above. In June, Flora's owners will open Xolo nearby for taco loyalists (floraoakland.com). About a 10-minute walk from the Fox, Picán is famous for its three-day buttermilk fried chicken and 18-page bourbon list (picanrestaurant.com). New People For Japanese-pop-culture fiends, this cinema and art gallery serves Blue Bottle Coffee and tasty bento boxes from Delica (newpeopleworld.com). The Art Institute of Chicago Pritzker Prizewinning architect Renzo Piano's new limestone-and-glass Modern Wing took almost a decade to build; generous amounts of natural light illuminate modern works by artists like David Hockney (artic.edu). Terzo Piano The new restaurant in the Modern Wing is all about white-on-white futuristic style. Star chef Tony Mantuano of Spiaggia finds the perfect nexus between Italian dishes and Midwestern ingredients, as in his butternut-squash ravioli with artisanal Wisconsin cheese (terzopianochicago.com). Sidney Harman Hall The Shakespeare Theatre Company's supermodern, glass-fronted home couldn't be more unlike the Globe (shakespearetheatre.org). Proof Two blocks from Sidney Harman Hall, this wine bar (left) has a fanastic 1,200-bottle list (proofdc.com). Cowgirl Creamery The California cheesemaker's shop is an essential stop for organic, triple-cream Mt. Tam and Fra'Mani charcuterie (cowgirlcreamery.com). AT&T Performing Arts Center This huge new complex includes the Dee and Charles Wyly Theatre for dance and drama (designed in part by Rem Koolhaas) and the red, glowing, Foster + Partnersdesigned Winspear Opera House (attpac.org). Samar Near the Center, Southwest cuisine pioneer and chile champion Stephan Pyles goes global with Spanish, Indian and eastern-Mediterranean small plates. Sit at the tandoori bar for naan straight from the oven (samarrestaurant.com). Tei An Chef Teiichi Sakura's latest Japanese obsession is the soba noodle. His new place near the Center has a windowed soba-making room so diners can watch the action (214-220-2828). The Tadao Andodesigned Modern Art Museum of Fort Worth displays dazzling pieces by Mark Rothko and Andy Warhol (themodern.org). A short drive away is chef Tim Love's Love Shack. Try the burger with fried quail egg (loveburgershack.com). De La Cruz Collection Contemporary Art Space Local art patrons' Design District gallery (delacruzcollection.org). Pizza Volante New District spot with wood-fired pies and a mozzarella bar (pizzavolantemiami.com). Sra. Martinez Star chef Michelle Bernstein's Latin-Mediterranean tapas, like tomatoes with Spanish goat's-milk cheese (sramartinez.com). Museum of Arts and Design Among the exhibits at the white-tiled MAD, left: a silver necklace as big as a dinner plate and a dodo made of fast-food-chicken bones (madmuseum.org). Robert MAD's acid-yellow-and-pink dining room has outrageous views of nearby Central Park and a Mediterranean menu by chef Matthew Kaufman (robertnyc.com). A Voce Columbus Chef Missy Robbins and her team make amazing panna cotta, left (avocerestaurant.com). Lincoln Center Part of an ongoing $1 billion renovation, the new David Rubenstein Atrium sells day-of tickets for 25 to 50 percent off. Chef Jonathan Benno's ambitious new restaurant opens this fall (lincolncenter.org). Bar Boulud French master Daniel Boulud's sublime wine-and-charcuterie bar (barboulud.com). Guggenheim Museum Frank Lloyd Wright's spiraling masterpiece celebrated 50 years with a renovation that stripped 11 layers of cracked paint from its exterior. Go by May 12 to catch Marc Chagall and Pablo Picasso in "Paris and the Avant-Garde" (guggenheim.org). 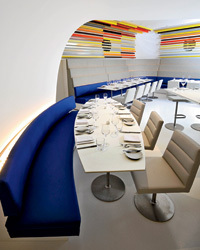 The Wright The museum's new restaurant is a stark white space wrapped in technicolor art. David Bouley protégé Rodolfo Contreras cooks dishes like striped bass with fennel and paprika (thewrightrestaurant.com). High Line Diller Scofidio + Renfro architects reinvented a rusted, weed-strewn elevated freight track as an improbably beautiful park (thehighline.org). The Standard Grill Under the High Line, chef Dan Silverman cooks rib eyes and duck-fat potatoes for fashionistas; there's a beer garden, too (thestandardgrill.com).